Sometimes there is a rhyme and reason for why I do a particular retro review on a game. Sometimes. Other times, such as this one, I review an older game just because. 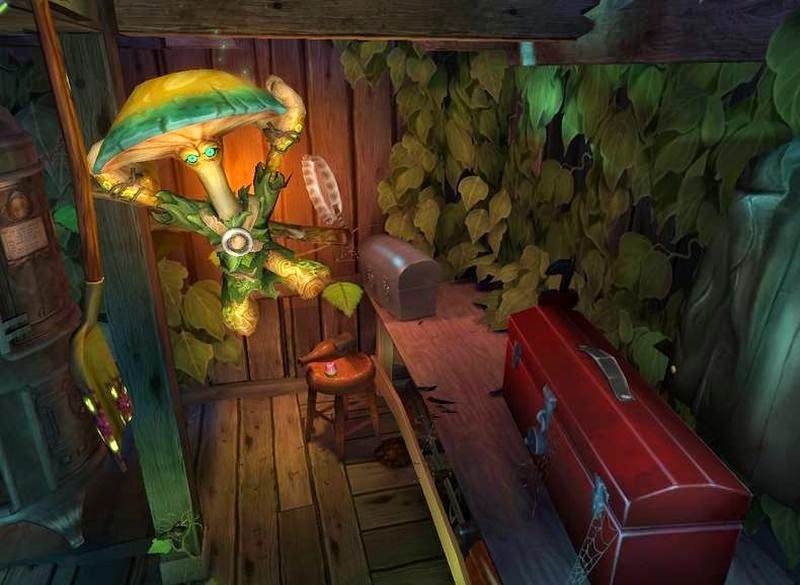 Mushroom Men: The Spore Wars was an eccentric 3D platformer for the Wii. I finally got around to beating the game early last week, and now I have a review to share on this sleepy Sunday evening! One of the many things I miss about the Wii was how it was essentially the PlayStation 2 of that generation. What I mean by that is that a lot more experimental and off-the-wall gaming experiences were to be found on Nintendo's eccentric little white system and in retail form, no less! Red Fly Studio's Mushroom Men: The Spore Wars is such a game. Not only is it a character-driven 3D platformer, something unheard of in this day and age in gaming, but it's an eclectic one with loads of personality. There is indeed fungus among us with The Spore Wars, but is that fungus of good quality? 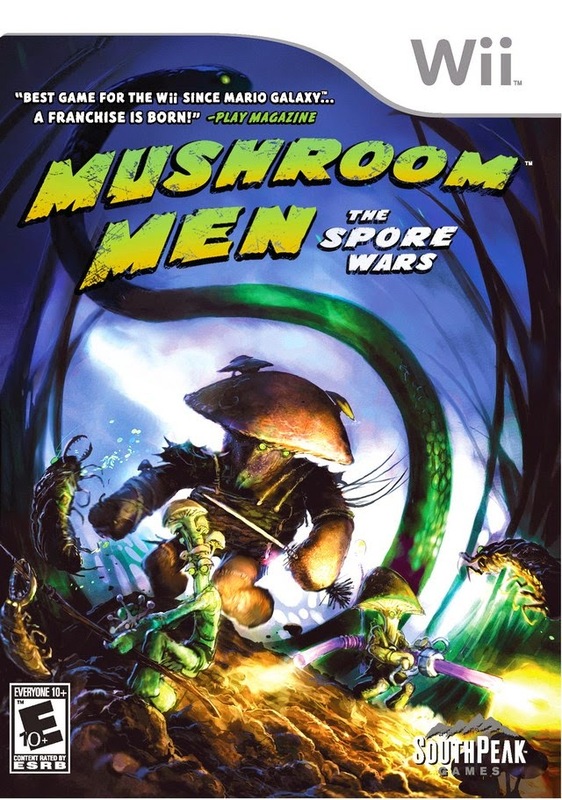 Mushroom Men: The Spore Wars starts out with an asteroid crashing into the Earth. This asteroid leaves off a mysterious green dust that is harmless to humans, yet packs a wild punch to the floral, fauna, and fungi of the world unknown to the humans. To survive from the harsh outside world and creatures that have turned nasty due to the asteroid's green dust, fungi-- now able to think for themselves, communicate, and walk freely-- form tribes. However, these tribes spark a civil war that our protagonist Pax, a wandering mushroom, finds himself involved in. Something told Pax that the dreaded "stick"
was not the appropriate weapon for this battle. The Spore Wars spans nine levels, ranging from linear affairs to levels in scope more befitting of a collect-a-thon platformer. The world constantly amazed me, throwing in everyday objects like decks of cards, trash can lids, audio cassettes, and more as places to platform on; areas like trailers, sheds, and houses to explore; and what would be small annoyances to a normal sized character turn into big obstacles when you're playing as someone who is three inches like Pax is. What secrets are housed within these four walls? Aside from accomplishing level goals like taking out vicious rabbits in a shed by using Pax's telekenetic powers to interact with switches and buttons, causing giant objects to crush those completely un-cuddly creatures, levels present optional tasks like collecting meteorites, of which there are nearly 90 in total. Collecting enough of these powers Pax up, presenting him with more health to utilize in his adventure. There are also egg-like containers that reveal weapon parts. When a certain weapon has all of the required parts acquired, you can create that weapon. 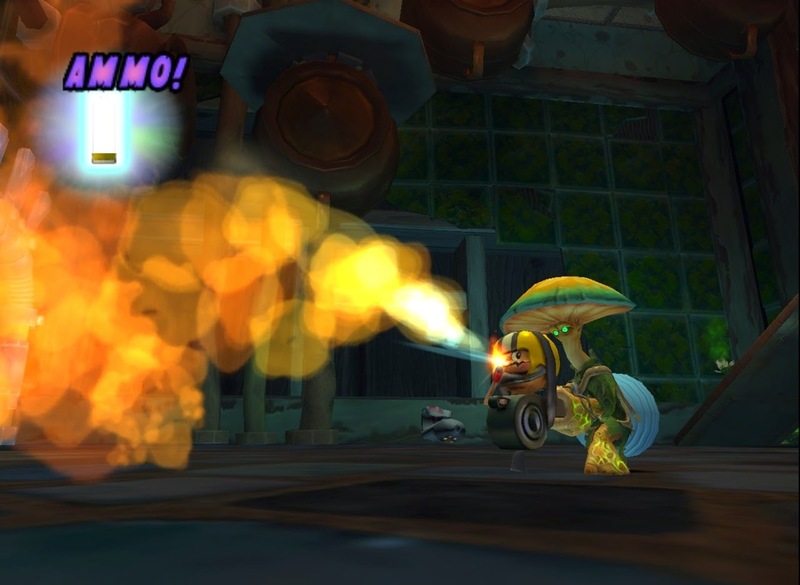 From weapons that thrust to weapons for crowd control, collecting all of the weapons in Mushroom Men: The Spore Wars is not only helpful to extend the otherwise short playtime of the game, but it also allows Pax to have greater attack power, needing less strikes from his weapons to slay stronger foes. to a string to deal heavy damage to foes. One of the toughest things to nail down with a 3D game, especially a 3D platformer that requires a lot of character movement, is the camera. 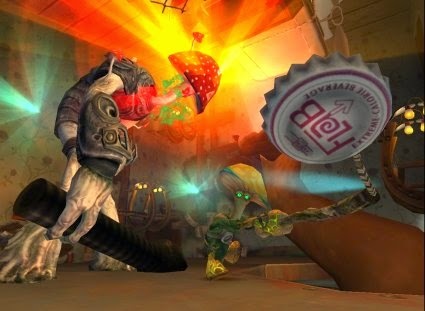 Unfortunately, Mushroom Men: The Spore Wars' camera leaves a lot to be desired. While it offers manual movement with the d-pad on the Wii Remote and it's not too much of a burden during expansive areas, when you're in a close-ranged, almost claustrophobic area of the game, the camera can get caught on walls and in-level geometry. This problem is further aggravated by the lack of a lock-on system for doing battle with enemies such as spiders, scorpions, rats, cockroaches, and other pests. To attack a foe you have to shake the Wii Remote, which all to itself isn't that comfortable or intuitive to do. When you attack, depending on the weapon protagonist Pax carries, you will either thrust or slash forward. This means the camera moves during this attack animation, making it so you have to constantly readjust the camera position after each attack Pax unleashes on foes. Many times you can completely whiff and attack due to the position of the camera, resulting in some really annoying combat scenarios. This is not exemplified any better than trying to face off against aerial enemies, which can just be an effort in futility. to a crawl but brings a hefty dose of pain to enemies. Pax has defensive capabilities that you can use. By holding down the Z button on the Nunchuk you can bow Pax's head down, using his head to block all frontal attacks. If enemies have surrounded Pax, you can press the C button to evade and roll out of the way. The cap at the top of Pax's mushroom body will deteriorate when more damage is dealt to him, resulting in his core being exposed. Thankfully, enemies and certain plants in The Spore Wars drop health-recovering green pods that heal Pax if you find his health is dangerously low. "Whee! Look, ma. I'm on SuperPhillip Central!" 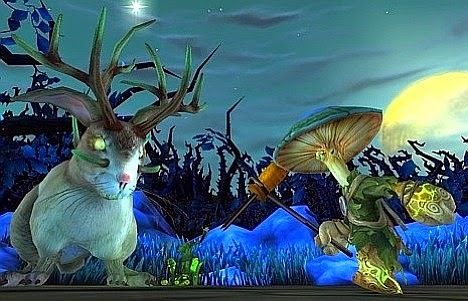 Mushroom Men: The Spore Wars art style displays an earthy and rustic world. The amount of detail in environments is quite stunning, especially when you consider the hardware the game is running on. While objects in the environments look nice, ground and wall textures don't do much to impress, offering a muddy consistency at best. Still, The Spore Wars' environments and areas are rich with atmosphere and a grand sense of ambiance. 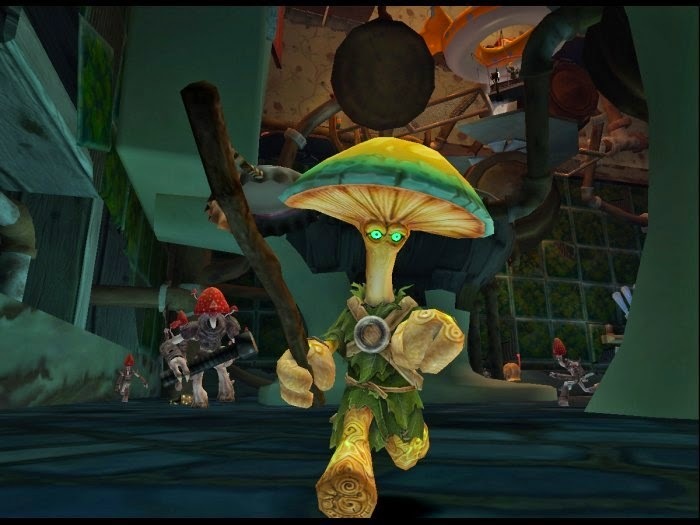 Meanwhile, the majority of the music fits the mood of Mushroom Men: The Spore Wars well, composed mostly by Les Claypool, which is a name that fans of the band Primus should know quite well. Pax and a wily jackrabbit! 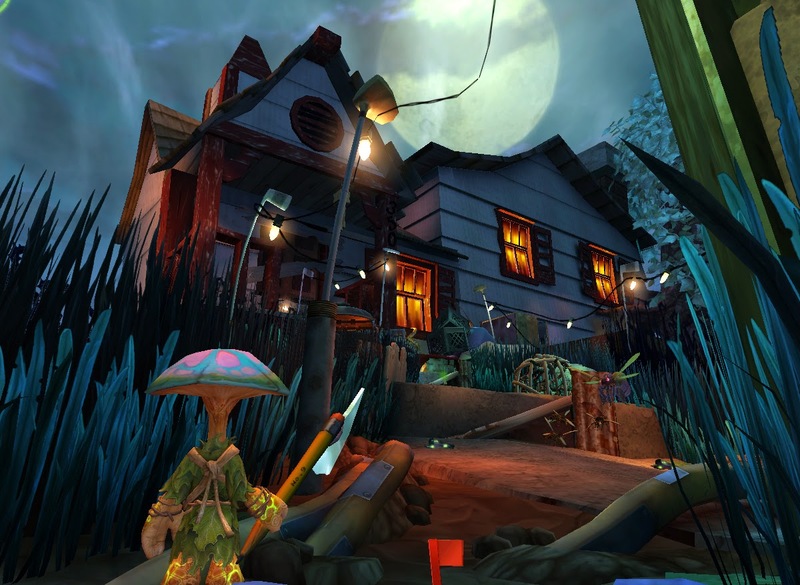 Overall, Mushroom Men: The Spore Wars suffers with its campaign brevity, troublesome camera, and lack of lock-on. While these issues don't destroy the game from bringing any semblance of fun at all to the player, they do detract from easily recommending it to Wii and Wii U owners on the fence about buying the game. If you think you can wrestle with a finicky camera without experiencing too much aggravation, then Mushroom Men: The Spore Wars is worth a play. For everyone else, if you have to play one game starring a type of mushroom, try out Captain Toad: Treasure Tracker.